Reiki is a japanese word meaning ‘Universal Life Energy’. I often refer to reiki simply as Energy Healing because that’s what it is. Keeping things simple. We are all made of energy. It’s a scientific fact. All matter is made of light and sound. We are all vibrating energy. The table in front of you is also made of light and sound. So, it only makes sense that you can heal your energy body with healing energy. Whenever you feel unwell, there is resistance towards this divine energy that you are made of. Healing Energy simply reminds your body what it’s “supposed to do”. It shows the body how to vibrate again at a high, healthy frequency. So, then the part of your body that has this sluggish, dark, stuck energy (pain, inflammation, unwellness in any from) is exposed to the high frequency of healing energy and adjusts itself back to it. This is basically how energy healing works. There are many, many ways to heal yourself, energy healing is just one of them. It’s very simple and anyone can do it. I think they should teach it in elementary school, really. It is just so extremely helpful, because our lives can be so stressful and our bodies therefore tend to get sick quite often. Ideally, you want to decrease the stress in your life, so you don’t get sick in the first place, but until that happens reiki is an incredible tool that you have always with you. You can reiki yourself in the checkout line at the grocery store! Anytime, anywhere. a) You don’t have to know what is wrong with your body. Reiki goes first wherever it is needed most, no matter where you put your hands. You don’t need to be diagnosed and you don’t need to diagnose yourself. If something doesn’t feel good or you experience pain and aches or soreness from inflammation, simply use reiki and see what happens. The newer your ailment is, the quicker it will disappear. If you have been suffering from some sort of chronic disease for a long time, you probably need to reiki every day for a few days or even a couple of weeks. 3 days is a good amount of time, and about an hour each day works well. Fever in children can disappear as quickly as in 3-5 minutes and it doesn’t come back. Children are easy. They’re suckers for reiki. Their energy is very soft and malleable, because they are so “new”. b) You can’t really do anything wrong. 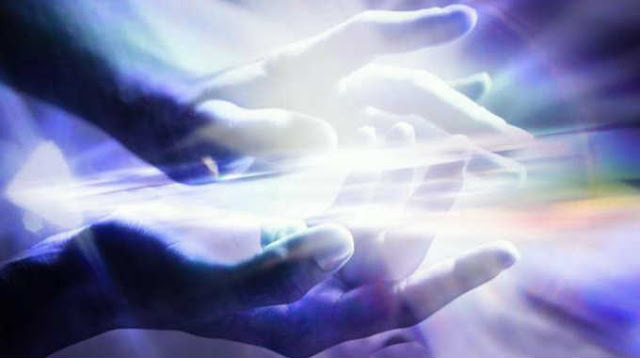 If you intend for healing energy to come into your body, it will come.You can reiki yourself for 5 minutes or an hour. And the energy might keep flowing afterwards, too. You may experience a warm, tingling feeling, but it could be a cool feeling as well, or you may feel nothing, but I think that is very rare. Reiki feels like you are being hugged with love on the inside. It’s just wonderful. You might feel all of a sudden very relaxed and want to take a nap. Or you might feel more energized and want to go out and do things. Whatever your body needs, reiki will ‘set things right’. 1. Put your hands palm up and imagine love and light from God and the Universe streaming into your hands. You can say a prayer or ‘thank you’ if you like. 2. Lay both of your hands on your upper chest, over your breast bone on top of each other. Underneath the breast bone is your thymus gland which produces t-cells, which are part of your body’s immune system. T-cells fight bacteria, viruses and cancer cells. B-cells also fight the same cells but are generated in your bone marrow. So, if you are new to reiki, putting your hands on top of your thymus gland is a great way to jumpstart your immune system. And if you do it for the first time, it’s an easy place to feel the warm tingling energy of the healing energy. 3. Just let the energy flow. Your intent switches the reiki on. So, all you need to say is “Abracadabra” – well, I’m kidding, but you could say that, whatever gets you in the mood, really. I simply think: “Go, reiki!” Kind of like cheering it on. I think the best mantra is probably: “Just let the energy flow.” My reiki master told me years ago that the energy comes in through your crown chakra, goes to your heart and then from your heart into your hands out into your or someone else’s body. Since this is divine energy that is probably correct. However, I believe, we are all divine life energy, and we are surrounded by divine life energy, so it is accessible in any way you can imagine. You don’t have to think about how the energy gets to your hands, really, all you need to do is “intent for it to flow”. I often say “Your intent can move mountains” and it’s true, it’s what makes anything happen in your life. You can also book a distance healing session with me (or other wonderful practitioners online). Go to my Healing Room page and follow instructions there. Click here. 1. Sit in Gassho position (hands in prayer position in front of you). 2. “Intend” to receive a full Reiki attunement. 3. Imagine that you have roots growing out of your feet and going down into the earth below you and grounding and earthing your entire body. 4. When you are ready, visualise (imagine) white light entering the crown of your head and filling the whole of your body from top to toe. See it entering each one of your chakras in turn, filling, cleansing, balancing and harmonising each one. Visualise the white light filling your arms and the whole of your hands then coming out of the palms of your hands and filling the whole world! 5. Sit for as long as you like, before drawing your ‘roots’ up from the earth and bringing yourself back into the present, now fully attuned to Reiki. This post was republished from luzialight.wordpress.com. You can find the original post here.